Lock in a great price for Mykonos Theoxenia Boutique Hotel – rated 8.5 by recent guests! Despina and his staff are great. you feel at home. Location is probably the best in town, right by the famous windmills. Nice sea view from the breakfast area. The best thing about this hotel is the staff, incredible helpful, always there for you, the hotel is amazing, rooms clean with good AC and perfect blackout for a pleasant sleep during day. And another plus was the locations, you have everything a couples steps away. An amazing idea, great staff, good location, rooms finishings and bath are the weakest link. The breakfast is excellent, and the terrific pool area is well attended by GaSs, lifeguard and pool manage extraordinaire. For pool service, Anna, Ionna, and Sergio are also tremendous. This property has the best personality of any hotel I've visited in Mykonos and balances a casual cool vibe with wonderful sixties design and an incredible location. The location can't be beat and I found all of the staff to be exceptionally kind and thoughtful. I really loved this hotel and I look forward to returning. The breakfast is great and the pool is wonderful. The hotel is right in town, but off to the side, so it's easy to drive to beaches without getting stuck in center-of-town traffic, but everything in town is within easy walking distance. It's a perfect balance. Theoxenia is amazingly peaceful and feels like a total oasis, despite being in a really busy spot. The location was fabulous, the staff was excellent, the breakfast each day was perfection, with so many excellent choices. I would return again without question. The hotel location was perfect. It was a walking distance to down town with a wonderful view. The facilities were beautiful and clean. The included breakfast was also very nice. The staff was kind and helpful. Our room was great for viewing sunset. The pool area was quiet and very nice. Staff was very attentive and the breakfast was stupendous! Impeccable service - the staff is really, really amazing and go that extra mile. Location is perfect as well - so central, yet so quiet. Top hotel in general. Mykonos Theoxenia Boutique Hotel This rating is a reflection of how the property compares to the industry standard when it comes to price, facilities and services available. It's based on a self-evaluation by the property. Use this rating to help choose your stay! One of our top picks in Mikonos.Located right next to the famous windmills of Mykonos and close to the picturesque neighborhood of Little Venice, Mykonos Theoxenia Boutique Hotel is a retro property that offers 60's-inspired suites, along with a wide variety of high-quality, modern facilities. Guests benefit from sparkling wine, a healthy trail mix bag, slippers, pool towels, deluxe body, hair care items and cosmetics upon arrival. Additionally, a smartphone for unlimited calls and mobile data is offered to guests. All rooms and suites at this boutique property are stylishly decorated with a strong 60’s influence with calm pastel colors, and open to a spacious balcony. They come with air conditioning, a mini-bar and a bathroom with a bath or shower. Some feature a spa bath. Guests can enjoy a complimentary welcome package on arrival, as well as complimentary Greek breakfast. 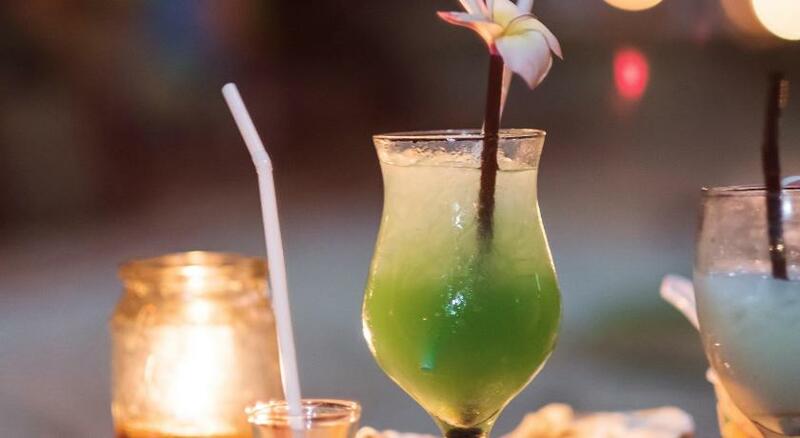 They can also enjoy a refreshing cocktail at the pool-side bar. The hotel features a main restaurant offering special gastronomic proposals, while an outdoor swimming pool and state of the art fitness and treatment rooms are also offered. During the day, a variety of relaxation and beauty treatments at the hotel’s spa can be offered. The pool area provides a perfect place to relax and enjoy the Mediterranean sun. The trendy bars and exciting nightclubs are just steps away from the hotel, without spoiling its serene and relaxing atmosphere. When would you like to stay at Mykonos Theoxenia Boutique Hotel? The Junior Suite consists of an open plan living room and bedroom with king-size bed and a private veranda with pergola, which offers an outdoor lounge area. The bathroom features a shower with hydromassage. Guests benefit from sparkling wine, a healthy trail mix bag, slippers, pool towels, deluxe body and hair care items and cosmetics upon arrival. This retro-themed room features twin beds. The spacious Deluxe Room has a lounge area and elevated sleeping area. The bathroom features a shower with hydromassage. Featuring direct Aegean Sea views, this air-conditioned room opens to a balcony. It offers a flat-screen TV with satellite channels and a mini-bar. A shower with hydromassage facilities is included in the bathroom. Wired Internet is available. This retro-themed room features twin beds and a sea view. The One-Bedroom Suite consists of a living room, a bedroom, and a private veranda with pergola and an outdoor lounge area. The private bathroom features a shower with hydromassage. 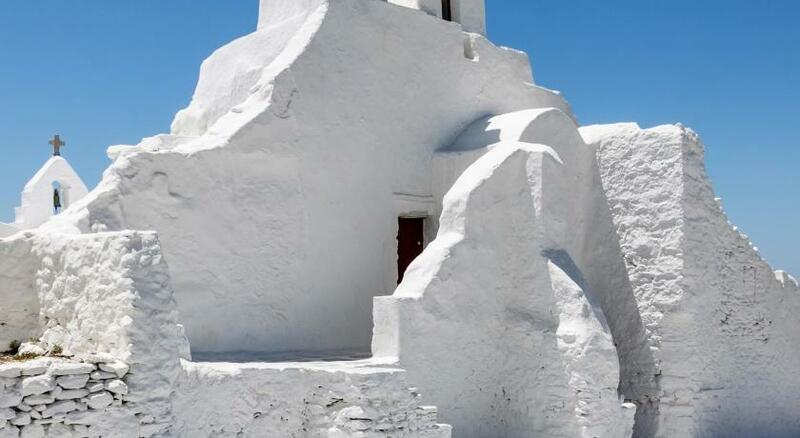 Mykonos Theoxenia is ideally located next to the famous windmills of Mykonos island; it combines the intense downtown life with the absolute calm of the hotel. A hotel which has hosted Hollywood stars, celebrities, heads of state and jet-set personas such as Jackie Onassis. House Rules Mykonos Theoxenia Boutique Hotel takes special requests – add in the next step! Mykonos Theoxenia Boutique Hotel accepts these cards and reserves the right to temporarily hold an amount prior to arrival. Nothing everything was perfect we celebrated our 35th wedding anniversary and we were spoilt with flowers fruit platter to help celebrate. They also provided a pick up service from port and to airport at no charge. Staff were wonderful thanks. Room was not cleaned properly. Some of my laundry was lost and never had response from hotel. On two of the days, the new towels left by the cleaning staff smelled like mildew, to the point that they could not be used. When asked at the reception for replacements at night, was told that the cleaning staff was no longer there and could not provide new ones -- inexcusable for a 5-star hotel. However, they arranged for the security guy to take new ones about one hour later. Had booked a room with garden view, but as seen on the accompanying photo, it was a room all the way at the end of the hotel, facing the neighboring building. When questioned at the reception if that's what they mean by "garden view," was offered to change to a much better one, which completely changed the experience at this hotel for the better. The property is so conveniently located to town, just 3 minutes walk, whilst very quiet and private. 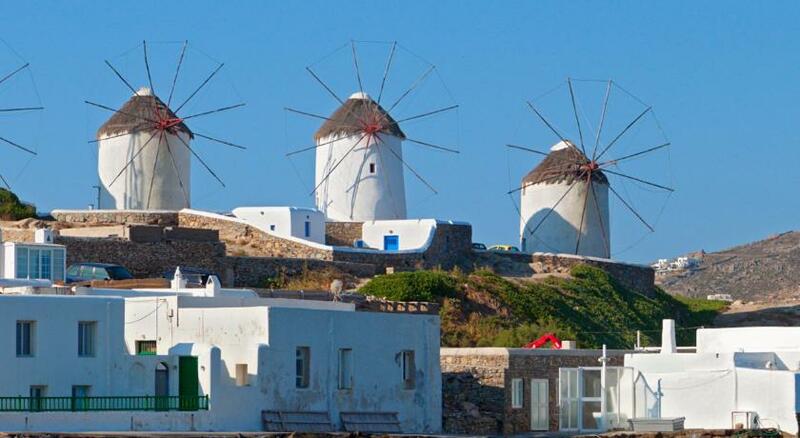 Views of the coast and famous Mykonos Windmills. Our room was clean and comfortable. We loved this location with its spacious grounds and pool amenities. Staff were friendly and helpful. We hope to return one day and would recommend to others. Hotel rooms need to be updated. For the price paid one expects better. I can say the same to the overall property. 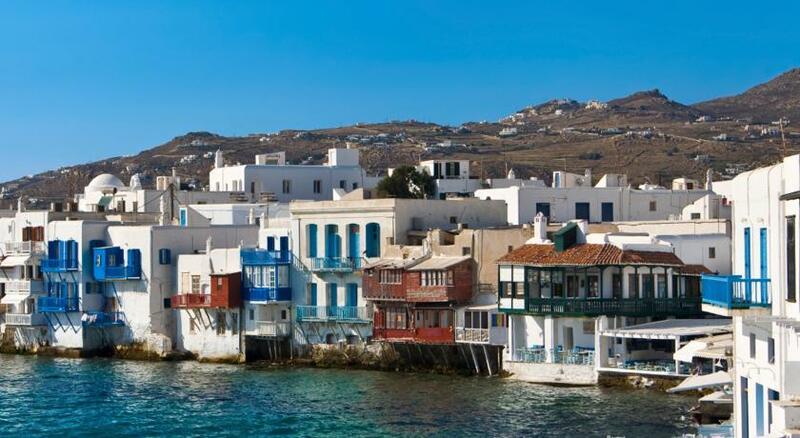 Ideally located for Mykonos town, and the staff are extremely friendly and helpful.